The processor we're using in the USB Doodad is an AVR ATmega328P. This very capable processor is at the heart of the popular Arduino educational microcontroller platform. 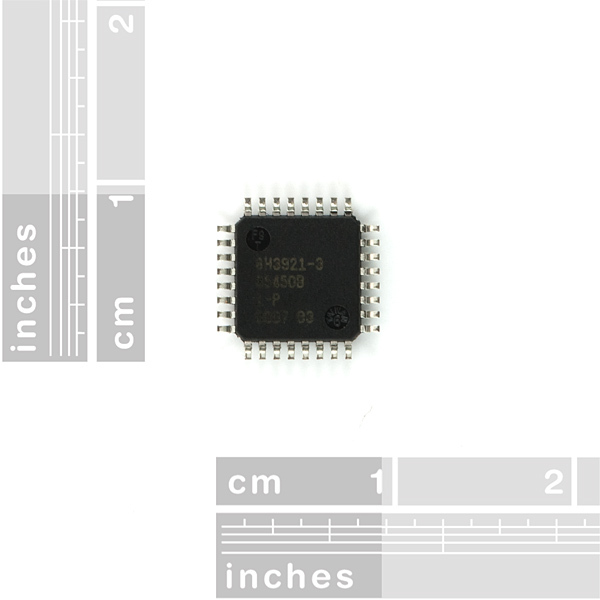 The two most common packages for the ATmega328P are the PDIP-28 and the TQFP-32. Because the whole purpose of the USB Doodad is to use surface mount components, we want to use the TQFP-32 package. Armed with a USB Doodad prototype board that Ross etched, I thought it was time to try soldering this chip. There are several ways to solder SMT ICs. A good guide is in this SparkFun SMT tutorial. The method I used was using solder paste and hot air. In order to do hot air soldering, I use a "hot air rework station" which I bought for about $80 in China. I found another one at Ameritronics which looks very nice, nicer than mine. Ideally, I'd use a syringe of solder paste, but I don't have one. Instead I used the paste I covered previously. I applied my solder paste with a jeweller's screwdriver. Not a very precise way of doing it, but it did the job. I applied one thin line of solder paste along the line of IC pads, then squished the chip pins into the paste. Then I ran some liquid flux along the pins on all four sides of the chip. Next, I used the hot air to melt the solder on each corner of the chip. That was to fix the chip into place. Finally, I ran the hot air along each side of the chip in turn. The combination of pins, solder paste and flux means that when the solder paste melted, it blobbed around each pin. I didn't get any bridges between pins, but if I had, I'm confident I could have fixed it with some desoldering braid. My success makes me think that beginners could solder it too, if they had the right equipment (a hot air rework station). And if we had a board with a solder mask (as we'll surely have for Doodad a little further down the track), I think beginners could do it with a regular iron too, if they had a video to watch showing how it's done. Well, that's how I soldered a TQFN-32!